We had the good fortune to travel north during a quick heat wave. The temperatures were in the late 30’s Farenheit. We arrived and quickly started gearing up for the climb in the prep house. It was quite the cool place, with a wood burning stove, winter wonderland memorabilia decorating the walls and bar with enough PBR stocked to make any hipster proud. However, we didn’t drive up 5 1/2 hours for the beers, we came to climb, so we geared up. Knives at our feet, axes in hand we strolled out in confidence. Sixty foot tower of ice? That’s all you got? Ha! Truth be told, it took each member in the group a subtle adjustment period to get used to the ice. Unfortunately, contrary to popular belief, you are not supposed to dig your axe into the ice. All you achieve is to blind yourself with snowy mist. It took each of us a few moments to learn to read the grooves in the ice, to place our axes in those crevasses and bury our bladed toes into a proper hold to thrust ourselves upward. For my first time I must say I enjoyed this sport very much. I personally did alright, ascending the shorter tower a few times. I do not, however, take the hero award. That goes to my fellow adventurer Mindy, for she climbed and at some points crawled all the way to the top of the larger 75 foot beast before any of us could. A few moments she thought she couldn’t make it. She screamed that she could not feel her arms. We all retorted that we simply wouldn’t let her come down till she reached the top. She was too damn close to give up now. Several of the team members volunteered to drag her rope and pull her up if she truly couldn’t make it. It did not come to that. Mindy’s arms may have been a little numb, but they still worked. When she finally reached the top of the tower the whole group wailed and cheered as she raised her axe in victory. Thanks to her momentum, the rest of the crew burned to meet her challenge to the top, and many did. A worthy adventure of comradery and ice. 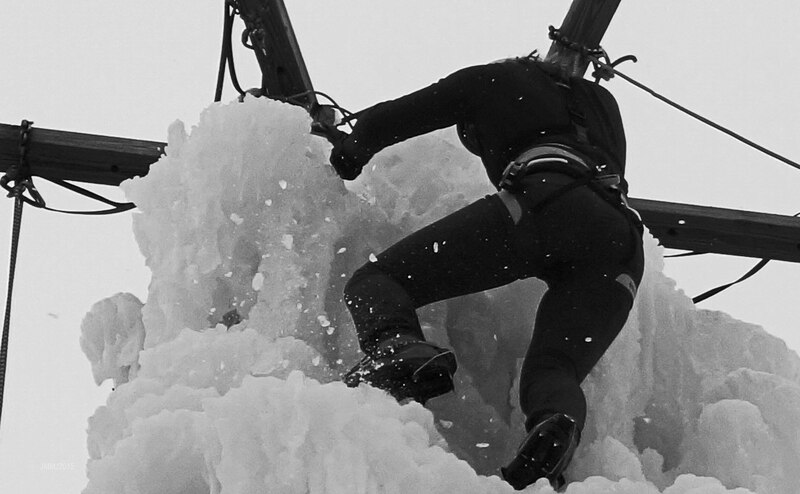 This entry was posted in Adventure, Travel and tagged adventure, black & white, climbing, Ice, iceclimbing, Michigan, photography, snow, Travel. Bookmark the permalink.